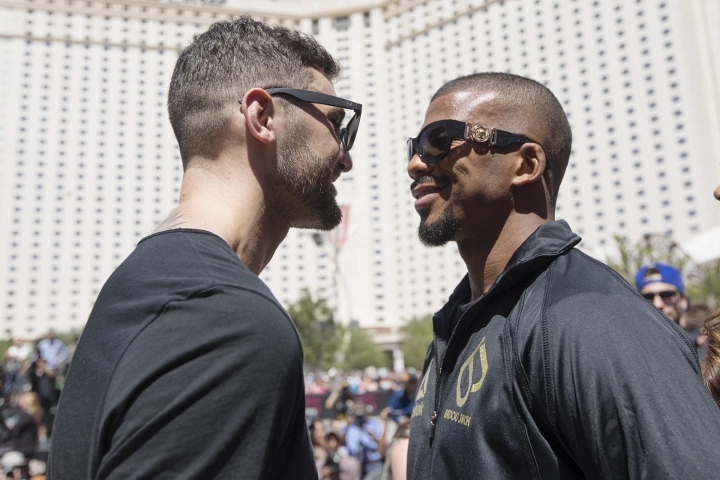 We found Nathan Cleverly in relaxed mood despite being underdog in his first WBA light-heavyweight title defence against Badou Jack in Las Vegas. The Welshman is 3/1 outsider with Sky Bet to keep hold of the belt he won against Juergen Braemer last October although 1/4 favourite Jack is stepping up into a new weight division after reigning as WBC super-middleweight title-holder following victories over Anthony Dirrell, George Groves, Lucian Bute and a draw with James DeGale. "I just love this place. This is my favourite city on the planet. To fight here in Las Vegas and defend my world title is great. Badou is a top fighter and it's going to be a tough fight. He's fighting an established light heavyweight like myself. I'm a two-time champion of the world and he's going to find out what I'm about. "I just told him welcome to the division. He's going to find out the hard way. I'm going to give him a rude introduction to the division and show him how a world champion does it. This is an interesting fight with two world class fighters. I'm going to leave here with the victory on Saturday night. "It's already a big fight with Badou Jack, but to be part of this event, it's truly historic. It's a special feeling." "Right now I'm just excited to be here in front of the fans. I can't wait to put on a show Saturday night. I'm going to knock Nathan Cleverly out. "This is the best camp I've had of my career. I have an amazing team and we've worked well together. I'm ready to get in the ring. This is the biggest stage you can be on. All my my teammates have been training hard and the whole Mayweather Promotions stable is ready to fight." [QUOTE=robbyheartbaby;17991436]I can't argue with that..[/QUOTE] but no offense intended just stating a fact. Thanks. No hard feelings I hope? [QUOTE=OmarRueben;17978997]I know exactly what I am talking about and that is the truth. The UK is a damp wet dreary over cramped little island with goofy people and too many muslims. [/QUOTE] I can't argue with that..